Ben Affleck must be at a lucky point in his career. His third directorial effort had recently been released in theaters and is already a commercial and critical hit . . . like his two previous films. And he never struck me as the type who would direct and star in a film about the CIA rescuing American diplomats from the Middle East, let alone co-produce it. But he did and the result is the movie, “ARGO”. “ARGO” began in early November 1979, when Iranian militants stormed the U.S. Embassy in Tehran, Iran and took most of the civilian and military staff hostage in retaliation for American offering refuge for the deposed Shah of Iran. At least six staff diplomats managed to get out of the embassy and seek refuge at the home of Canada’s ambassador, Ken Taylor. With the six diplomats’ situation kept secret, the C.I.A. assigns one of their operatives, one Tony Mendez, to find a way to get the diplomats out of Iran before they could be discovered. After dismissing several proposals, Mendez creates a cover story that the escapees are Canadian filmmakers, scouting “exotic” locations in Iran for a science-fiction film. Mendez and his C.I.A. supervisor Jack O’Donnell, contact John Chambers, a Hollywood make-up artist who has previously crafted disguises for the C.I.A., in addition to his work in the “PLANET OF THE APES” film series. Chambers puts them in touch with a film producer named Lester Siegel. Mendez, Chambers and Siegel set up a fake film studio and successfully establish the pretense of developing Argo, a “science fantasy” in the style of “STAR WARS” in order to lend credibility to the cover story. Meanwhile, the escapees grow frantic inside the ambassador’s residence. Shredded documentation from the American embassy is being reassembled, providing the militants with evidence that there are embassy personnel unaccounted for. I am going to cut to the chase. I enjoyed “ARGO” very much. What am I saying? I really enjoyed this movie. So far, it is one of the better ones I have seen this year. Once again, Affleck knocked it out of the ballpark with a first-rate thriller that gave audiences a peek into the efforts of the C.I.A. to save those six diplomats who managed to get captured by the militants. Affleck, along with screenwriter Chris Terrio, did an excellent job in setting up the entire story from beginning to end. One of the movie’s gem scenes featured the actual storming of the U.S. Embassy in Tehran on November 4, 1979. It is quite obvious that Affleck, along with cinematographer Rodrigo Prieto, used a hand-held camera style to film this particular sequence. And although I am not a fan of this particular style, I must say that it suited this particular sequence very well, projecting an effective sense of chaos and panic. “ARGO” featured other memorable scenes, including Mendez’s efforts to recruit both Chambers and Siegel for his mission, a tense encounter between Taylor’s Iranian maid and intelligence officers looking for the diplomats, the humor-filled setup of the Argo Operation in Hollywood, frustrating moments in which Chief of Staff Hamilton Jordan came close to shutting down Mendez’s operation, the final escape from Iran by air and a nail-biting sequence in which the same group hit the streets of Tehran for a “location scouting mission” in order to maintain their cover. and Deniz Göktürk’s art direction, along with Jacqueline West’s realistic looking costume designs. But “ARGO” would have never worked by Affleck’s outstanding direction and the talented actors and actresses that were part of the cast. Not only was I impressed by Affleck’s direction, but also his subtle performance as C.I.A. operative Tony Mendez, who did not need guns and fighting skills to accomplish his task – merely brains and nerves of steel. John Goodman was marvelous as the witty and slightly cynical make-up artist, John Chambers. He also had great chemistry with both Affleck and Alan Arkin, who portrayed the sardonic and prickly Hollywood producer, Lester Siegel. I was not that kind to Bryan Cranston in my review of “TOTAL RECALL”. But it was great to see his magic again, in his fiery and funny portrayal of Mendez’s C.I.A. supervisor, Jack O’Donnell. “ARGO” also featured some wonderful supporting performances as well. Kyle Chandler made two brief, but very memorable appearances and President Jimmy Carter’s foul-mouthed Chief of Staff, Hamilton “Ham” Jordan. It is a pity that his role was not longer. I was also impressed by those who portrayed the besieged diplomats – the always entertaining Tate Donovan, Clea DuVall, Christopher Denham and Kerry Bishé. Scoot McNairy and Rory Cochrane were especially memorable as a paranoid Joe Stafford and the hilariously sarcastic Lee Schatz. Victor Garber gave solid support as Ken Taylor, the Canadian ambassador who gave the diplomats refuge. And Sheila Vand was marvelous in the tense scenes that featured the Taylors’ Iranian housekeeper, Sahar. The movie also featured solid performances from the likes of Zeljko Ivanek, Richard Kind, Titus Welliver, Bob Gunton and Philip Baker Hall. Naturally, “ARGO” is not a perfect movie. Not all of it is historically accurate. This was very obvious in one shot that featured a dilapidated HOLLYWOOD sign that overlooks the Los Angeles Basin. The sign was restored to its former glory in November 1978, 14 to 15 months before Tony Mendez’s arrival in Southern California. And I found Mendez and the diplomats’ encounter with the Iranian airport security guards and escape from the country somewhat contrived and manipulative. Flawed or not, I cannot deny that I found “ARGO” to be one of the most satisfying movies of the year. I enjoyed it that much, thanks to a first-rate script by Chris Terrio, superb direction by Affleck and an excellent cast that included John Goodman, Bryan Cranston and Alan Arkin. 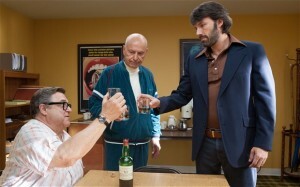 In the end, “ARGO” strikes me as another triumph for Affleck and his two co-producers, George Clooney and Grant Heslov. I liked this movie. Great direction, screenplay and acting. A very well deserved Oscar winner.